Dell latched onto the hot TV series “The Rifleman” less than a year after its premiere. The Chuck Connors/Johnny Crawford ABC series began in September 1958 and by July-Sept. 1959 Dell published Four Color #1009. It sold well and Dell began regular numbering with #2 (Jan.-Mar. ‘60), assigning art duties to noted western illustrator Warren Tufts (1925-1982) who drew #2-9. Tufts, also a magazine illustrator, animation writer, layout artist and juvenile book illustrator, had created and drawn the moderately successful CASEY RUGGLES western comic strip from ‘49-‘54. 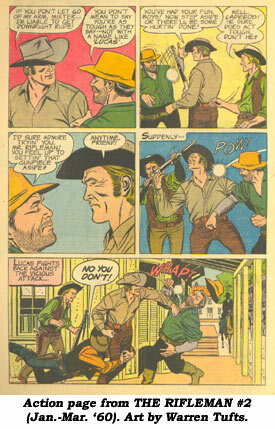 Also for Dell, Tufts drew issues of DALE EVANS, SWAMP FOX, TALES OF THE TEXAS RANGERS, WAGON TRAIN, ZORRO and others. Other artists picked up the work with issue #10, including Dell workhorse Nat Edson who’d also drawn issues of ROY ROGERS, SUGARFOOT, TALES OF WELLS FARGO, RESTLESS GUN, DALE EVANS, JOHNNY MACK BROWN, RANGE RIDER, BUFFALO BILL JR. and others for Dell. Gold Key took over the publishing of THE RIFLEMAN with #13 (Nov. ‘62) and kept the comic on a quarterly basis through its final issue, #20 in Oct. ‘64, over a year after the series left the air. Incidentally, #18 is a direct reprint, cover and all, of Dell’s #5. 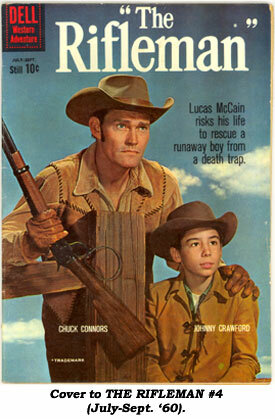 All Dell and Gold Key issues have photo covers of Chuck Connors and Johnny Crawford. FC#1009 lists at $63 in Fine, #2-10 go for about $30 in Fine and #11-20 book out at about $25.